At least Criterion wasn't just teasing us when they slapped a “No. 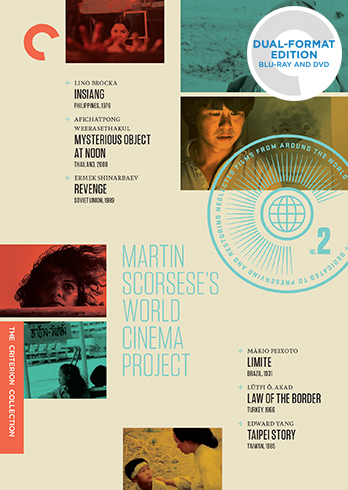 1” on their first boxed set of “Martin Scorsese's World Cinema Project” back in 2013. It took three-and-a-half years to get to. “No. 2” but it was well worth the wait. The initial set expanded the scope of the Criterion Collection in a valuable way. 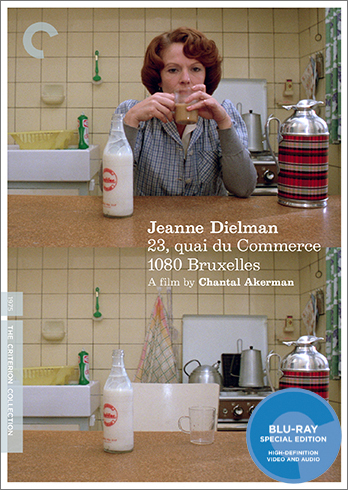 Criterion takes its mission to distribute “important classic and contemporary films” very seriously, but that mission has inevitably focused greater attention on a handful of national cinemas, with France, Italy, and Japan being much better represented than most others. The World Cinema Project, an outgrowth of Martin Scorsese's The Film Foundation,also “preserves and restores neglected films from around the world” making them a perfect complement as they cover geographies not always highlighted by Criterion. The first “World Cinema Project” volume included films from Senegal, Mexico, India, Turkey, Morocco, and South Korea, and gave me my first chance to see work by major directors I had only read about before like Djibril Diop Mambety and Ritwik Ghatak (their films “Touki Bouki” and “A River Called Titas” were, in my opinion, the best on the set). The second volume of the project brings us another film from Turkey, but also makes stops in the Philippines, Thailand, Brazil, Kazakhstan, and Taiwan, and spans a range from 1931 to the very end of the 20th century. “Insiang” (1976) opens with the graphic depiction of pigs being gutted in on a slaughterhouse floor, and a quick location shift to a slum town built along a river promises a continuation of the blood-letting, at least in figurative terms, though viewers shouldn't be quick to rule out the literal either. Filipina star Hilda Koronel plays the title character, a young woman clinging to innocence and decency under harrowing circumstances. She's saddled with a bitter, vengeful mother (Mona Lisa) who blames Insiang for her father abandoning the family: “Wherever your father is now, I hope he and his girlfriend drop dead!” That's one of mom's more affectionate outpourings. The situation worsens significantly when a hunky young bully (Ruel Vernal) moves in with mom while clearly having his eyes set on the lovely Insiang as well. Filipino director Lino Brocka was absurdly prolific, shooting over sixty features in just a twenty-year span before his death in a car accident in 1991 at age 52. Like many of his films, “Insiang” was shot quickly (furiously might be a better term), in just seven days with little time for retakes, and the film's lean shooting schedule contributes to its sense of immediacy and authenticity. “Insiang” marries heated melodrama with gritty social realism, grounding the more lurid plot developments in a vividly depicted setting where the options for just everyone from the most vulnerable on up to the aspiring alpha male are severely limited. Sweaty, muscle-bound young men drunk on faux-machismo drive much of the action, but the true core of the film is the mother-daughter love/hate relationship which ultimately transforms into a revenge tale. The accomplished Koronel is always riveting as the thoughtful, resourceful protagonist, but Mona Lisa dives deep into the tormented soul of a spiteful woman who has abandoned all hope and inflicts misery on anyone she perceives as being under her control. She bares her fangs in scene after scene, but the film pulls off a minor miracle by making her a sympathetic figure in the end, if only for a fleeting moment or two. “Mysterious Object at Noon” (2000) is the debut film of the Thai director Apichatpong Weerasethakul who has come to define 21st century art-house cinema as much as any world filmmaker. Apichatpong has sent modern cinephiles swooning with gorgeous, enigmatic films like “Tropical Malady” (2004), “Syndromes and a Century” (2006), and the contemplative Palme d'Or-winner “Uncle Boonmee Who Can Recall His Past Lives” (2010). Modern masterpieces all. 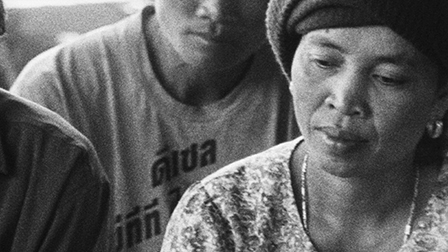 Apichatpong is often bundled in with the so-called “slow cinema” directors who have formed a rebellious vanguard against commercial cinema's frenetic, ever-intensifying pace, but the seductive power of his work stems from much more than just the power of the long, languorous take. The ending of “Syndromes and a Century”... oh my, I'm swooning again. Anyway, it all started (feature-wise, anyway) with strange (yes, mysterious) hybrid movie that appears to blend documentary and fiction elements, though perhaps it's more accurate to say it shuttles back-and-forth between different fictional elements in an amorphous, chimerical structure that ultimately renders such distinctions irrelevant. 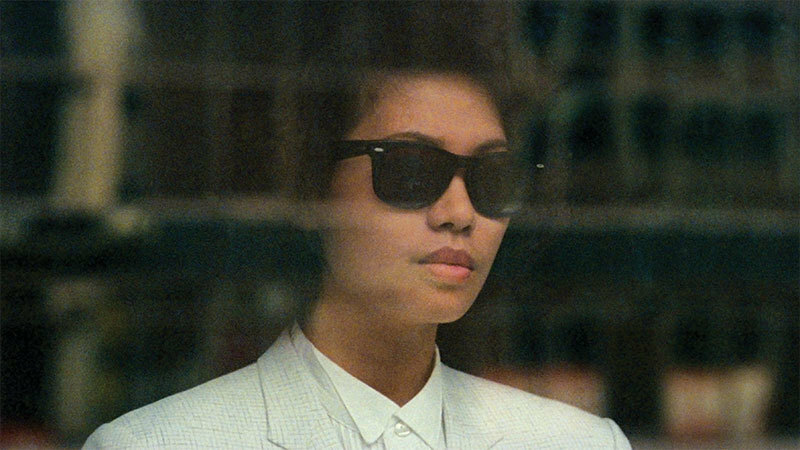 Taking its cue from the surrealist “exquisite corpse” game, “Mysterious Object” opens with a woman tearfully recounting the story of how her father sold her for bus fare only to be prompted by a man off -screen (presumably Apichatpong) to tell another story next. Real, make-believe, it doesn't matter. The camera then continues to rove the Thai countryside filming new subjects who each asked to add their own chapter to a constantly-evolving tale that begins as the simple story of a student and his caring teacher Dogfahr (played by multiple actresses) before turning into a science-fiction/horror tale with a touch of “Body Snatchers” about it, but with ample time for a boxing match, a plane crash, medical melodrama, musical interludes, and even fourth-wall busting moments when the cast takes a lunch break and the camera boom droops well into the shot. The film surprises at every turn, excites even when it becomes, quite frankly, a bit boring, and defies ready description. I had seen it before, though I suspect even many die-hard Apichatpong fans are getting their first opportunity to see it with this release. I'll be interested to learn if they had the same thought that occurred to me on this second viewing: “Mysterious Object” is the rare debut film that may well need to be seen after viewers have watched the rest of the director's work in order to fully appreciate it. “Mysterious Object” contains so much of the Apichatpong-verse that was still waiting to be unpacked over the ensuing years (with, presumably, much more to come) that it feels like you're watching oracular previews of “Syndromes” and “Boonmee” and so forth. In that sense, it reminds me of the early Werner Herzog film “Fata Morgana” (1971), also a weird docu-fiction hybrid that features traces of most ofthe images and motifs that would later come to be known as Herzogian. What I really mean to say is that I absolutely love this movie. It's a real head-scratcher, though, no argument there. So is “Limite” (1931), a 1931 Brazilian silent film that has almost no right to exist. First of all, it was made by a 22-year-old aspiring poet from Brazil named Mario Peixoto who had no previous filmmaking experience and was eager to make a movie inspired by a single photograph (pictured at the top) he had seen in a newspaper in Paris. Tough sell there and when he pitched his idea to a few accomplished filmmakers, he was rejected. Undaunted, he somehow managed to make the movie on his own, working with an amateur cast and crew consisting mostly of his friends. Second of all, the film was a commercial flop and Peixoto would never make another movie though, fortunately, the poetry thing worked out well for him. The movie was admired in certain cinephilic circles, but was seldom screened, and was confiscated in 1966 by the military government. It may well have ceased to exist entirely if not for a heroic restoration effort undertaken in 1975. “Limite” tells the tale of a man and two women stranded at sea in a tiny boat, but, no, I can see I've already led you astray. It's not really a tale at all, but a series of associative images that may or may not be recounting the story of how each of them wound up on the boat. That's not really important. The young, enthusiastic tyro filmmaker seems much more interested in exploring the formal limits of this new-to-him medium than in constructing a narrative. I suspect the best way for me to explain is to recount the images that have endured since I watched it a week ago. In one sequence, a woman works intently at a sewing machine, and the film cuts in to extreme closeups of fabric, buttons, and tape measures. In another scene, the camera swoops like a raptor at a man's face over and over again. Peixoto loves closeups that isolate body parts – a hand partially covering an open mouth, gangly legs, overhead shots of a man's parted hair. All with frequent cuts to rolling waves dappled by sunlight. Does it add up to anything? I don't know that Peixoto cared either way, but I'm sure I can't tell you after a single viewing. I was enraptured by lengthy stretches, but ultimately felt the poetic experience was stretched out too long at just under two hours. On the other hand, I'm also a firm believer that saying a movie is too long is kind of a dopey thing to say, but I'm stuck with it now. Even dopier is the fact that I've yet to mention this silent film's lush score which is just as much of a structuring element as the images. Reconstructed closely from the original score, it consists of classical standards by Debussy, Satie, Prokofiev, and others, and sure sounds great in this restored version. “Revenge” (1989) is a straightforward enough title for a film that is anything but straightforward. Directed by Ermek Shinarbaev with a screenplay by the esteemed writer Anatoli Kim, “Revenge” is considered one of the defining films of the Kazakh(stan) New Wave, a wave I freely admit I was unaware of and which emerged as the Soviet Union was dissolving. The film takes place in Korea and on Sakhalin Island (north of Japan) and begins in the 18th century before jumping ahead to 1915 for a tale that will unfold slowly over several decades. A drunken teacher kills a girl in his charge, prompting her father to hatch a complex revenge plot which involves a long and fruitless pursuit, then turns to siring a child with his new wife and raising the boy to seek vengeance for the half-sister who died before he was born. The simple title turns out, of course, to be ironic, as the pursuit of vengeance consumes multiple lifetimes and spans half a continent, only to wind up... well, I won't reveal it, but as you're watching the film, I'm sure you can figure out that Shinarbaev and Kim have no plans to present a linear tale with a neat, conclusive finish. On one of the set's extras, film producer Mevlut Akkaya compares Turkish writer-actor Yilmaz Guney to Marlon Brando and James Dean. I don't think he intends primarily to compare their acting styles, but rather refers to the iconic status Guney has in Turkish film culture. From what little I've read about Guney, this may understate the case as Guney didn't just play rebels on screen, but was a real-life crusader and outlaw, spending time in jail which didn't stop him from directing films by proxy. 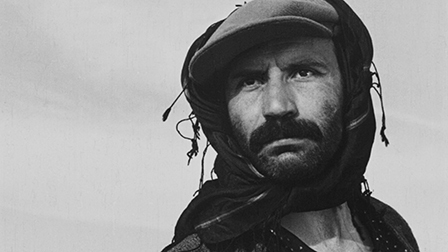 Guney doesn't direct “Law of the Border” (1966) – that honor belongs to veteran Lutfi O. Akad – but he is the star of this frontier Western (by way of rural Turkey, that is) which pits impoverished villagers against government forces. Lean, ruggedly handsome Guney plays Hidir, one of the local leaders in a town where smuggling is effectively the only career option. Said occupation involves the precarious crossing of a border constantly patrolled by the military and protected by mine fields – oh, those poor sheep. This sleek film (just 76 minutes long) wastes little time, but doesn't indulge in a simple good guy-bad guy dichotomy. Hidir is noble, but also stubborn and impulsive, while a new lieutenant sincerely wants to improve the declining towns under his watch with the help of a teacher eager to build a school to educate the boys (no mention of the girls' prospects, alas) so they have more choices than their fathers. Tradition and pride prove frustratingly resistant to change. Hidir tries his best to be a hero, but it's tough to overcome your social programming. “Law of the Border” is yet another movie that was almost lost for good when a new military government in 1980 seized many films deemed critical. Only a single and incomplete print of the film survived, making this the perfect salvage operation for the World Cinema Project. I won't go so far as to say this boxed set saves the best for last, but Edward Yang's “Taipei Story” (1985) is pretty tough to beat. Actually, that's not true. 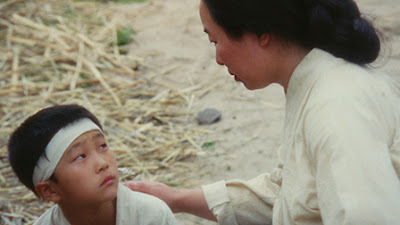 I think that Yang's “A Brighter Summer Day” (1991) and “Yi Yi” (2000), both also released by the Criterion Collection, are slightly better, but consider that high praise for Yang, not an indictment of the film. The stories of “Taipei Story” have, in a sense, lurched to a halt just as the film picks them up. Lung (played by famed director Hou Hsiao-hsien, who also co-wrote the film) and Chin (pop singer Tsai Chin) profess to still have dreams, but it's uncertain if they even still have a life together. They can barely muster any enthusiasm while looking at a new apartment in the opening scene, and their vague plan to “go to America” doesn't convince anyone, including them. Chin's professional plans have been derailed by a corporate takeover which serves as a bitter reminder that personal loyalty has no value on a balance sheet. Lung's only fading pleasure revolves around his (also fading) memories of his youthful days as a baseball star. Traditional slogans of the Chiang Kai-shek era provide neither comfort nor guidance, but turning to mainland China, Japan, or America for a new direction seems no more promising, the latter being defined as a place where you can shoot someone in your backyard, then drag him in your house and claim self-defense. Freedom! The study of modern alienation, along with the numerous shots of sterile, imposing city architecture, glass facades reflecting the abyss, inevitably bring to mind comparisons to Antonioni, but Yang's protagonists aren't quite as glamorous in their disaffection. Lung may be wallowing in his own misery, but he's still a down-to-earth guy (Hou looks like like an everyday fellow, not a dashing leading man) who can muster enough energy to try to help both an old friend who's down on his luck and Chin's deadbeat father, providing brief sparks of warmth, or at least the prospect thereof. “Taipei Story” is immaculately filmed and edited, as are all of Yang's films that I've seen. He was a modern master, and his death in 2006 at age 59 was a devastating loss for the film community. My only disappointment is that this really feels like a movie that should have its own solo release with ample extras, the same treatment Criterion gave to “A Brighter Summer Day” and “Yi Yi.” I hope that having it available (for now) only in this set won't limit its potential viewership. “Revenge” and “Taipei Story” both look sharp and mostly damage-free, as you would expect from two of the most recent films on the set. “Insiang” has a naturally “grubby” look to it, so it doesn't pop as vividly as the other two films just mentioned, but this high-def transfer provides a surprisingly sharp and detailed image with an appropriately subtle color palette. “Mysterious Object” was shot in black-and-white on 16mm reversal stock and also has its own “grubby” look that is an integral part of the viewing experience. I can't quite say this features the same sharp image detail as other films on the set, but I think it looks just like it's supposed to, so no complaints here. “Limite” and “Law of the Border” each show considerable damage related to their perilous journeys through life. One extended sequence in “Limite” is missing entirely. Some other shots are badly damaged enough that only the center of the image can be seen in the middle of the decaying edges. In a strange way, this adds to its appeal, though I'm sure everyone involved would prefer pristine, intact prints to work from. The undamaged shots are often quite breathtaking to look at in this high-def transfer. “Law of the Border” has significant scratches and other damage visible in many shots and had to rely on multiple sources, but we're fortunate it exists at all. “Law of the Border” has the tinniest sound, but it's fine, and the other films get treated with Mono mixes for all except “Mysterious Object” which gets a 5.1 surround mix. Optional subtitles are provided for each film. For each film, we get a two-minute introduction from Martin Scorsese, speaking on behalf of the World Cinema Project, and providing a little information about the filmmakers and the restoration involved. A thick, square-bound booklet is also tucked into the cardboard box alongside the three discs and includes individual essays for each film. Back when I reviewed the first volume of the World Cinema Project, I guessed that “Mysterious Object” and “A Brighter Summer Day” would be part of the next set, so I'm going to give myself one-and-a-half points for that. How about “Memories of Underdevelopment” and “Soleil O” for the next set? (Yes, I'm just scrolling through the titles listed at the World Cinema Project site) Considering how strong the first two sets have been, we can reasonably trust the selection process for the next one. Let's just hope it arrives a little quicker this time around. As an adult who remains baffled by the ubiquitous small talk that comprises most social interactions, I can empathize strongly with the young protagonists of Yasujiro Ozu's “Good Morning” (1959). 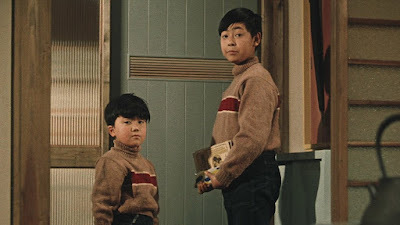 After thirteen-year-old Minoru and seven-year-old Isamu brattily demand their parents buy a television so they can watch sumo wrestling and baseball, their father (Ozu stalwart Chishu Ryu) scolds them for their sassy backtalk. A petulant Minoru retorts that adults spend all their time saying stupid things like “Good morning” (and “No, you can't have a TV!”) and enlists his little brother in a vow of total silence until they get their television and, perhaps, until the adults understand just how absurd their constant prattle sounds. The boys' refusal to observe the expected social niceties and to comply with the inherent power structure between generations sets off a chain reaction in their tiny suburban neighborhood. 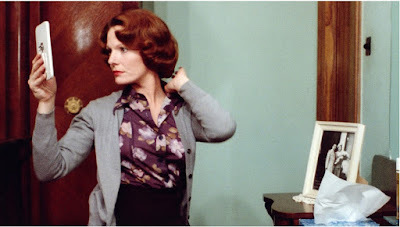 Gossipy housewives, who, like everyone, consider themselves the main characters in the story, take the boys' rudeness as a personal rebuke, and more specifically as a sign of their parents' haughtiness. Their mother thinks she's better than us? Well, we'll show her! The neighborhood's delicate social structure shakes, but never comes particularly close to collapsing in one this lightly comic offering from Ozu. And the boys' blinkered but sincere perspective ultimately underscores the significance of the insignificant interactions they protest. The content may be superficial, but the form of a “Good morning” or “This weather sure is crazy” is essential to enable humans to live together in relative harmony. Sometimes it even opens the door for far more intimate exchanges. I point all of this out mostly because I wanted to become one of the very few critics ever to make it to the fourth paragraph of a review of “Good Morning” without talking about farts. Fart jokes may not be the first thing that spring to mind when you think of the director of “Tokyo Story” (1953) and “An Autumn Afternoon” (1962) but farts (huh huh, he said “but farts”) grease the social skids as surely as any other form of communication in this film. The boys' ability to fart on command (indicating by peppery musical toots on the soundtrack) assures their place in the playground pecking order, and at least one of their fathers takes great pride in his firm and resonant tuba-farts that repeatedly trick his poor wife into thinking he's calling for her. It's tempting, at least for me, to think that Ozu is suggesting that no matter what orifice we use to communicate we're really all just talking out our asses, but he's much more appreciative of the nuances of daily social interaction than I am. Ozu and co-writer Kogo Noda have an uncanny knack for depicting complex, dynamic characters in just a few seconds of screentime; even the shameless gossips aren't allowed to turn into one-dimensional shrews. People are cranky when they think they've been treated unfairly, sunny when they're getting a fair shake, confident in private, and more tentative in less-controlled social situations. 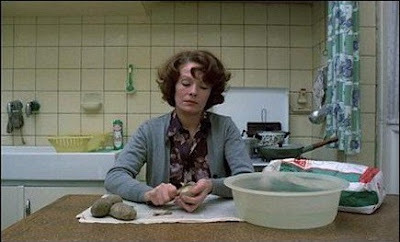 Even a romantic subplot between an unemployed teacher and his neighbor feels fully realized despite only being glimpsed intermittently, and pays off in a final scene which is a gentle but full-blast ode to the beauty and vitality of small talk. Ozu veterans might except Chishu Ryu to dominate the film, but Ozu gives his young stars ample room to shine, and wisely returns over and over to the little miracle he discovered in young Masahiko Shimazu, who plays Isamu. His chubby face with its awkwardly proportioned features plays like a live-action cartoon, and his exaggerated gestures echo the perfect calibration of a silent comedian. And he can fart like a champ. Periodic cuts to meticulously composed shots of the neighborhood's modest buildings, usually arranged in sharp diagonals, remind the viewer that it doesn't take a big (or naked) city to generate eight million stories. 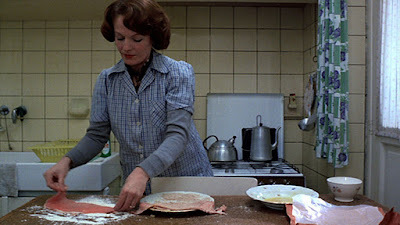 The film even ends by spotlighting a previously minor character, the one boy whose flailing attempts at flatulence end in disappointment, not to mention extra laundry for his confused and irritated mother. As the boy sits there brokenhearted, Ozu gleefully cuts to one final visual joke, a clothesline full of underwear just flapping away in the cool breeze. 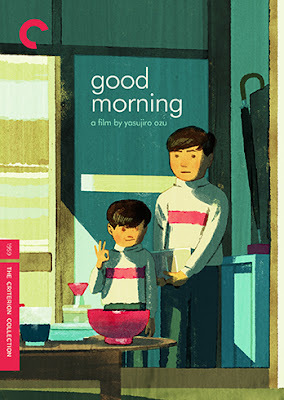 Criterion released “Good Morning” on a bare-bones DVD way back in another century (Aug 22, 2000), and while I don't have that one for a point of reference, most reports describe the old transfer as one of their weaker ones. Never fear. This 1080p upgrade, sourced from a 4K digital restoration, renders the film in sharp detail with a bright but never garish color palette. Close-ups really show off the detail in this high-def transfer which should make fans quite happy. The linear PCM mono track is sharp, like just about every Criterion release. Toshiro Mayuzumi's jaunty score can't help but remind listeners of Jacques Tati, and it sounds quite good on this lossless audio. Optional English subtitles support the Japanese dialogue. Cinephiles recognize David Bordwell as one of the most insightful film scholars still writing today. Bordwell helped to popularize the application of Vladmir Propp's narrative analysis in film studies and is renowned for his close stylistic breakdowns of art-house enigmas and Hong Kong action films. In a new 2017 interview (19 min.) recorded for the Criterion Collection, David Bordwell finally gets to talk about farts. Few could be more eloquent. Except maybe David Cairns who aptly describes “Good Morning” as “Ozu's fartiest film” in “Transcendental Style and Flatulence” (17 min.) Cairns also touches on a few non-flatulent topics, as does Bordwell. Criterion has also included a high-def upgrade of Ozu's 1932 silent film “I Was Born, But...” (90 min. ), also included on the “Silent Ozu” set from what appears now to be Criterion's defunct Eclipse line. “Good Morning” is often described as a remake of “I Was Born, But..” as the earlier film also features two children who go on a strike (hunger strike this time) to express their frustration with the adult world. However, the two films are considerably different, with “Good Morning” being the much lighter of the two. The disc also includes the 14 surviving minutes of Ozu's 1929 silent film “A Straightforward Boy.” This is an odd semi-comedy in which the title boy gets kidnapped, but turns the tables on his shady kidnapper – it ends with children pursuing the kidnapper, eager to get the same treatment he gave to the title boy which is... kinda weird. The slim fold-out insert booklet includes an essay by critic Jonathan Rosenbaum, who also talks about farts, but not as extensively as in the video features on the disc. It's easy to dismiss “Good Morning” as a slight entry in the Ozu canon, but even the gentlest of comedies can still provide profound insights. The film convincingly captures the daily rhythms of a small neighborhood, and penetrates deeply to see what makes it work and what threatened to tear it all apart at the seams. With the inclusion of “I Was Born, But...” as an extra, this is a significant upgrade over the old SD release and a must-own for Ozu fans.